Every 91 minutes, the International Space Station orbits the earth, some 190 miles above our heads. Right now, @astro_paolo, an Italian astronaut, is taking some epic pictures as well. The ones of the squished moon (distorted by the earth’s atmosphere) are pretty awesome. 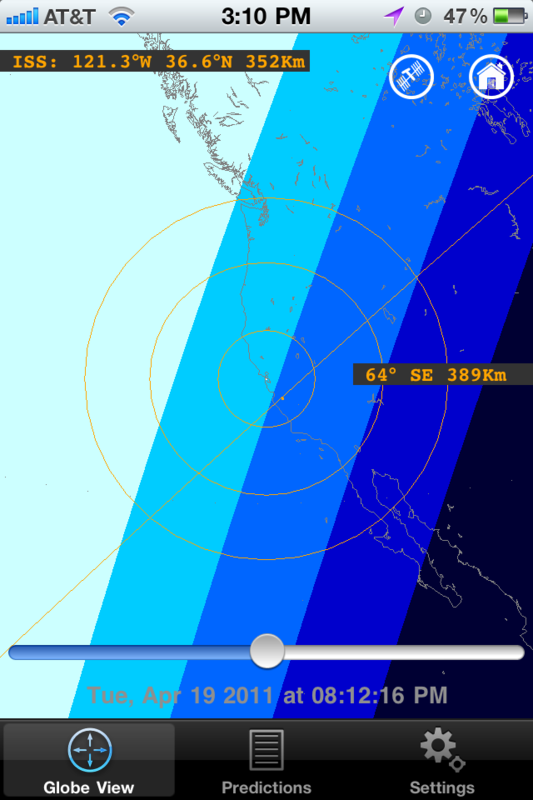 Satellites is a rather awesome iPhone app ($1) that shows you where the ISS is and will be. You can also ‘play’ the orbits forwards and backwards in time. Below we see tonight’s pass. The orange circle is the visible horizon of the ISS. 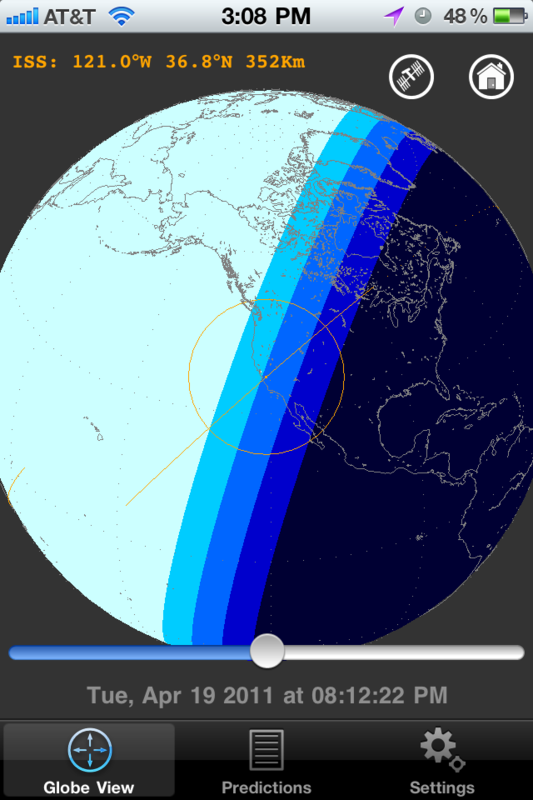 The orange line indicates the visibility of the ISS from the ground after sunset and before sunrise. (If you are iPhoneless, or want to see other satellites, n2yo.com is a pretty good resource with a nice Google map view). Even if it’s dark, you may see city lights. And since the ISS travels 4 miles a minute it will come out of shadow in no time. (In the Satellites app, you can maintain perspective on the ISS and fast forward through time — it’s pretty trippy.) If you just see a static shot of the horizon, the ISS is likely out of satellite/ground coverage over the middle of the ocean. UPDATE: No fog! But despite a fairly thick high cloud layer it was very bright, very high in the sky. A quick shot through my iPhone and binoculars here, and a better shot through my Lumix below. But the NASA ISS stream was down! Oh, the irony. There’s another pass on Thursday starting at 7:23, even higher in the sky — reaching 70º at 7:26. Should be pretty bright, but it moves far faster than you will expect. 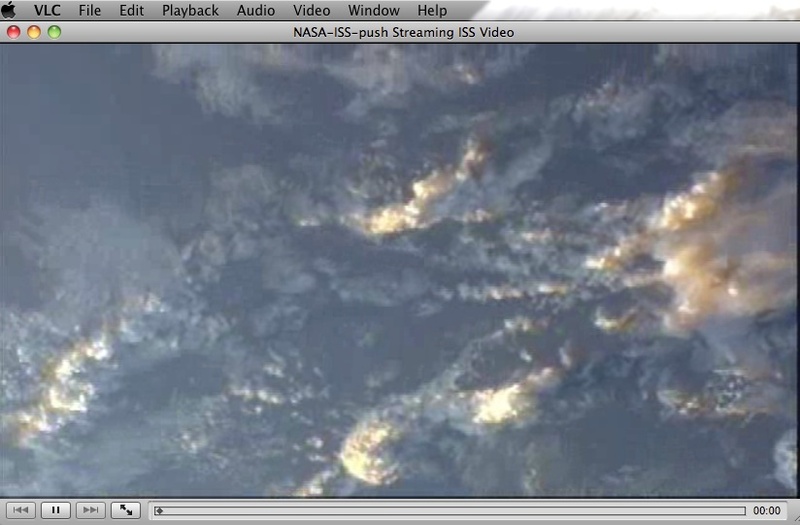 Hopefully the NASA video stream will be up this time. 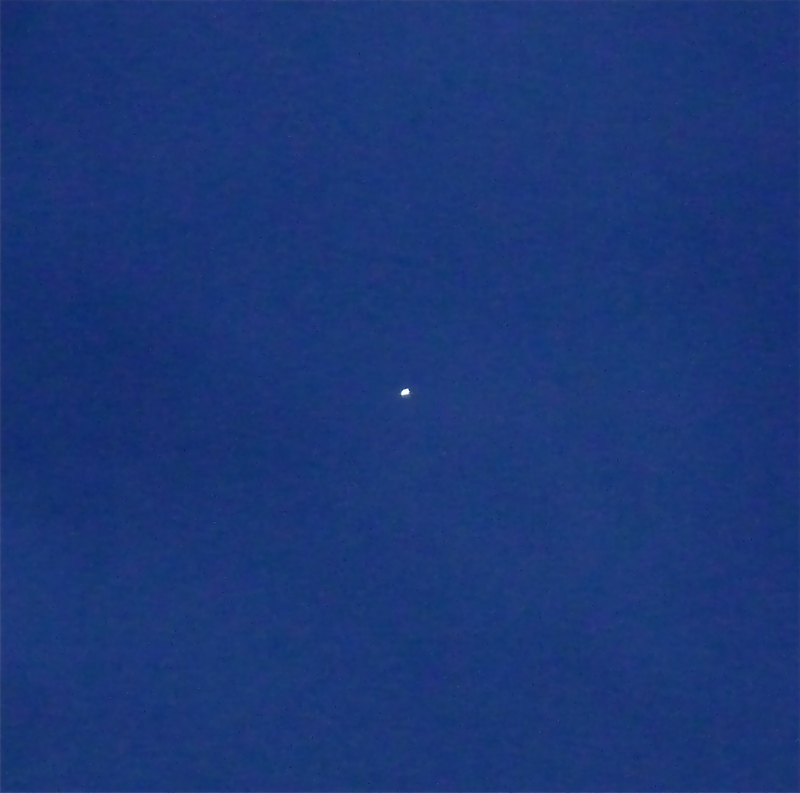 http://www.twisst.nl/ is also an awesome resource, that will send you a tweet when the ISS is going to pass overhead. It uses the location info you post to your twitter profile. Yes! twisst.nl is awesome, forgot to mention that one. Also, if you want to play the ISS stream on your iPhone, search for “Streamer” — free, and the only thing I’ve found that can handle .asx. There are also some daytime passovers coming up that are increasingly higher in the sky.